Flint and Detroit are certainly not alone as they face the problems that come with economic catastrophe and a dwindling population, as The Next American City magazine points out in its coverage of Germany's Shrinking City project. Pingmag has some depressing, yet oddly beautiful photos of cities on the wane and an interview with the project founder Philipp Oswalt. Although there's a decidedly European angle to Oswalt's efforts, the similarities between seemingly disparate cities like Flint and Leipzig (pictured above) are striking. Since (1989), East Germany has lost 1.5 million inhabitants (nine percent of its population) and reached an unemployment rate of 18.5 percent. A “survival handbook” with tales of Germans selling used bicycle parts, drugs, or homemade sausages to a diminished clientele in Wolfen-Nord or Leipzig, makes clear the poignancy and pressing nature of addressing cities left behind. Though many of the proposed solutions seem too tired, hypothetical, or playful to have much real impact, the small scale of the interventions, their focus on individual needs and the realities of existing conditions, provides a model for realism in planning. Filling in vacant lots with crops or arts programs makes more sense than trying to lure industry with office parks and other incentives. The (project) seem to prove the wisdom of adaptation, rather than a relentless push for growth. Recognizing that traditional approaches — subsidies, construction, demolition — have failed to turn the tide of shrinking is an important one. 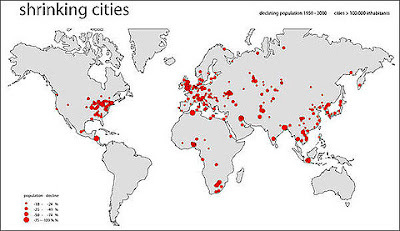 A world map of cities with the highest shrinking rate within the last 50 years (in red) courtesy of Shrinking Cities.